Following the conquest of Poland by Nazi Germany and the Soviet Union in 1939, hundreds of thousands of Polish families were torn from their homes and sent eastwards to the arctic wastes of Siberia. Prisoners of war, refugees, those regarded as 'social criminals' by Stalin's regime, and those rounded up by sheer chance were all sent 'to see the Great White Bear'. However, with Hitler's invasion of the Soviet Union in Operation Barbarossa just two years later, Russia and the Allied powers found themselves on the same side once more. Turning to those that it had previously deemed 'undesirable', Russia sought to raise a Polish army from the men, women and children that it had imprisoned within its labour camps. 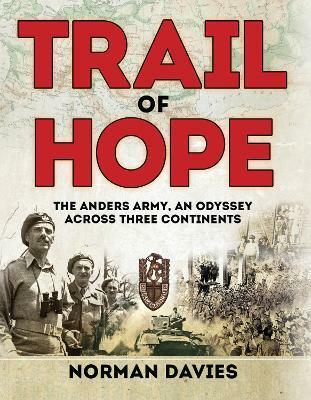 In this remarkable work, renowned historian Professor Norman Davies draws from years of meticulous research to recount the compelling story of this unit, the Polish II Corps or 'Anders Army', and their exceptional journey from the Gulag of Siberia through Iran, the Middle East and North Africa to the battlefields of Italy to fight shoulder-to-shoulder with Allied forces. Complete with previously unpublished photographs and first-hand accounts from the men and women who lived through it, this is a unique visual and written record of one of the most fascinating episodes of World War II. IX. Who were the Andersowcy? Norman Davies FBA, FRHistS is a British-Polish historian noted for his publications on the history of Europe, Poland and the United Kingdom. He is widely regarded as one of the preeminent historians of Central and Eastern European history. He is the UNESCO Professor at the Jagiellonian University, Professor Emeritus at the University College London, a Visiting Professor at the College of Europe and an Honorary Fellow at St. Antony's College, Oxford.